Rodinal Stand Development – This was my preferred method of B&W film developing when I first started film photography and developing film at home. Article provides a how to guide together with sample photos and thoughts along the way. When home developing B&W film I normally I use a mix of Xtol & Rodinal to stand develop my film but today I tried just Rodinal, 1:100. 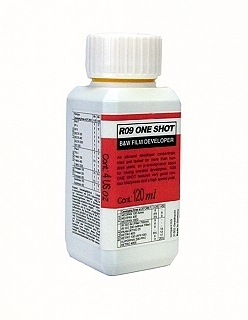 I say Rodinal but the formula I use is actually called R09 One Shot or R09 developer. You can buy it in 125ml bottles from eBay. Rodinal developer is sold in a few different forms. In addition to R09 developer (One Shot) I also have Adox Rodinal in a bottle that looks like this and it is also sold as Adox Adonal. I have not tried the Adonal version but the bottle looks almost identical to Adox Rodinal. For my 120 film reel depth in the Paterson tank I needed 600ml approx (to be safe) so used 6ml of Rodinal to tap water. Normally I develop for 19-23 mins so I did not want to wait the usual ‘1 hour’. I timed 30mins and did 1 agitation at 15mins (so this is semi-stand developing really)(for even results/ increased contrast) at 20 degrees. The standard Rodinal developer times that most people use or mention online is the famour 1 hour duration. If you are new to using the Rodinal developer I would say start with 60 minutes and check the results. If for you the film develops a little too exposed/ bright for you taste then next time shorten the Rodinal developer times by 10mins. You can just play around with it to taste. I have found there is not a hard and fast rule and I always experiment with different times and temps to see the effect. This was a model photography portfolio shoot with UK model Josie. I used my Mamiya RZ67 and Fuji Acros film. She had mainly digital photos taken on the day but when I seen a nice pose I grab the Mamiya RZ67 / Contax 645 for some film photography shots. The end result.. I actually much prefer this to my normal developing look for this photo at least. Very sharp, highlights not blown (nearly always are usually) and nice contrast and tonal range. I’m impressed! Regular readers will know I develop my black and white film at home using the Rodinal (R09 One Shot) semi-stand development method using times less than one hour. The more common approach is ‘Rodinal stand development‘ for a duration of one hour. I have already written one post on stand developing (link below) but as I like to experiment I am starting to fine tune my method (and I will continue to do so). The standard stand development method is a good safe option but can produce ‘flat’ negatives. By that I mean mostly mid greys and lacking contrast (highlights and shadows). I generally develop my Kodak T-Max 100 film in Rodinal for 40-45 minutes with one or two turns (“agitations”) during that time. What I noticed is when I have shot a roll of B&W film over a period of several days in varying light conditions the film negatives results will also vary dramatically. Photos taken in bright light/ direct sunlight/ contrasty light/ hard light such a direct flash / speedlights benefit from a shorter developing time (such as 40 minutes) and give high quality negatives with a broad dynamic range (highlight detail, range of mid grey detail and shadow detail). Photos taken in the shade / even light / overcast day / inside without obvious directional light will develop as just mid greys lacking contrast and clarity when using the same developing time. Luckily film retains a lot of detail so negatives can be pushed / pulled when scanned to boost contrast and if needed boost contrast further in PP. I know that all sounds obvious. It is not rocket science that contrasty light when taking a photo on film will give a more contrasty negative. But, the trick is when you want to create a contrasty negative from flat light. If the photos were taken on an overcast day increase your developing time and also the number of agitation during film developing and this will help the highlights (or brighter mid greys) develop further to give a negative with more contrast. Rodinal – How it works – Recap! OK, to recap how stand development works, highlight areas develop faster than areas of shadow. Developer around the highlights stops working after a certain time and then the remaining time lets the shadow detail develop further. If you don’t agitate the film and stand for one hour the highlight detail and shadow detail both have time to develop. The highlight detail is not blown as the developer becomes exhausted around highlight detail sooner so stops. For semi-stand development you are basically refreshing the highlights areas with new developer each time you agitate the film so the highlights develop further and faster. By stopping the time sooner the highlights are developed but some deeper shadow detail remains less developed thereby produce a negative with more contrast. That shorter time works well if photo are taken in ‘good’ light (good light being with direction). If however the light is flat then more agitations will refresh the highlights more to try to ‘over develop’ beyond the brightest seen when taking the photo and thereby giving a negative with more contrast. For film photography I often like to use my own home brew of Xtol and Rodinal developers mixed together to develop my black and white film negatives. I have used various ratios of each but all giving acceptable and pleasing results. I will maybe write another blog on the Xtol developer when I get time. Are Xtol stock and diluted Rodinal one shot developers? (Based on my own experience). I am self taught so learn as I go. My first disappointment was using a batch of developer that was a week old (since dilution from Xtol stock/ Rodinal concentrate) and the film negatives came out almost blank. The developer had been kept in a clear soft drink bottle in a dark cupboard. My first valuable lesson was diluted developer does not last as long as diluted fixer solution. I now aim to use a developer batch within 2-3 days of dilution and then dispose of it. Unlike the guy in the shop, I do not use the developer as one shot. I make up a mix 1L of Rodinal developer brew (diluted Rodinal) and develop as many as 6 rolls of film (mostly 120 medium format film but also the occasional 36exp 135 film) during a 2-3 day period. Now this is cheap film development if you do the maths! Obviously the active ingredients in the film developer becomes more exhausted after each roll of film developed so developing times will need to be increased accordingly. Even if you only develop 2-3 rolls of film per batch of developer you have still made a 100% or 200% saving on developer costs. More film myth breakers coming soon! If you are on a tight budget, say a student and need cheap film development to persue your hobby, another way to cut cost is to use a rodinal dilution such as 1:2 /1:3 etc. 1:3 dilution gives you 3x more film developed so if you reuse your rodinal dilution too (rather than as a one shot)(as I describe above) you now have a super cheap film developer! The problem arises when you have a ‘mixed’ lighting conditions roll of film. Some negatives will be near perfect already and some will be flat. If you agitate the film more during developing then you will blow the highlights on the contrasty negatives. If you agitate less the flat negatives will develop as just that, flat and grey. So in conclusion, I will try to make a note of the lighting conditions I shot the film in if films are being stored before being developed. For medium format film I will try to shoot an entire roll in similar light as you get less photos on a roll anyway (8-16 depending on 6×4.5, 6×6, 6×7, 6×9, with 645 format normally giving 16 negatives). For 35mm film when you have 36 exposures it is not always possible to shoot all images in similar light so in this instance I might develop with less agitations for a longer duration and increase the contrast in post processing (“PP”). I hope that made a little sense! The best way to learn is to try what method works best for you. Everyone is different but the above approach is how I currently develop my black and white film. So … this is what Ansel Adams means when he talks about “compensating developers” or “waterbath developers?” IE, the highs exhaust the developer quickly but the shadows go on cooking? You make it sound really easy. Thank you. Next Next post: Leica M9 Review (It’s BIG!) – All You Need to Know!